If this trend I've got going continues, Dry As Toast will be completely abandoned before February is through! I'm having such a good time walking around for hours trying to get The Shot and playing around on Photoshop that it's taking over my time for blogging. No worries though, I could never truly desert you. Above is my submission for today's class taken from Central Park's Bow Bridge, the second oldest cast iron bridge in the country don't you know. I loved the graceful arch of the bridge and doesn't this angle make it look like the whole thing is buckling? So what are you guys doing this weekend? A few hours ago, I went to see the teen superhero flick Chronicle, which just opened today. I liked it, but there was some room for improvement. There's also a friend's birthday celebration coming up and then it's Super Bowl Sunday. Do you guys really get into football? I only just watched my first game of the season a couple weeks ago and caught the Giants' entry into the Super Bowl. So I'm sure it's going to be madness in the city if the team wins this weekend. I'll explain why I like this shot here in case anyone criticizes you about the slanted perspective. The eye first tries to find some anchor on the image to understand the perspective of what it is looking at. At this angle, the foreground (bridge) appears to be straight, but then it curves off. The background, meanwhile, is slightly askew, making it just as disorienting. Love it. Now, you may have lost some of the surreal qualities of that perspective by (ironically) washing out some of the color. I may be misremembering the original, but I felt like the planks on the bridge popped out more before. This made the curve seem more drastic. Why do you think anyone would criticize it? Geez, way to bring on bad chi Andrew! I love it! Yay C is for Central Park and Cast Iron Bridge, D is for Damaris? Lol I'd be interested to see the originals, I'm not photoshop savvy and am kind of jealous that your are. Go Giants! I participated in a pool at work and so did SP, I'm so excited!! I'll probably just watch it at home, but I'll be comfty as hell! Love the banter above between Andrew and dama. I love slanted photos and pretend to take some myself. It makes you focus on one thing, I think. Instead of just glancing at it all and missing some intricate details. My favorite from the above photo? The looping circles in the bridge rail. It takes the arch from beginning to end and makes the bridge appear endless. Love it! 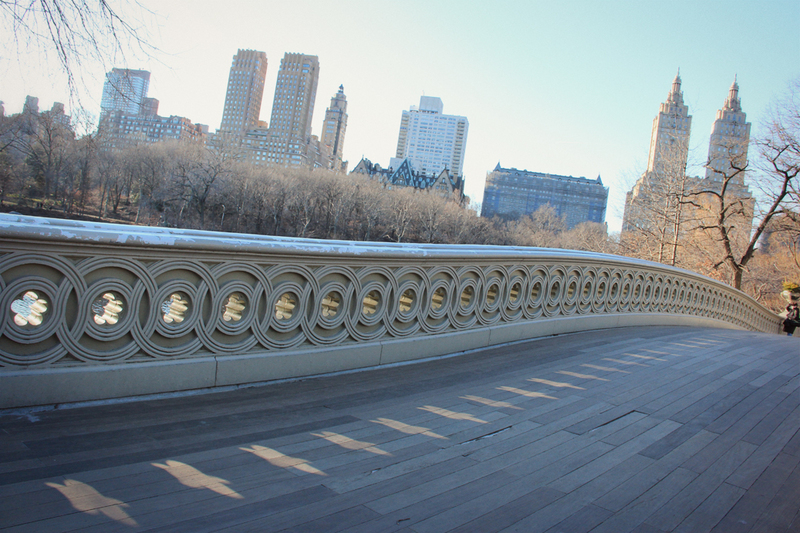 love how the shadows from the flower cut-outs are forming a pattern on the bridge! beautiful photo, dorkys! I spent yesterday alternating between working on projects and talking to family members on the phone, and this morning alternating between throwing snowballs for the dog to catch and making a start on catching up on blog posts (since I haven't been on here properly since Friday). This afternoon I plan to finish getting caught up with blogs, make sure I'm caught up with any e-mails, things around the house, etc, and then do more work on some projects I have on the go. This shot has a "sugar lens" style. That is, a from down low, off angle view... with some elements that go across the grain... like the sun through the rosettes on the bridge wall. I like that bit of play with the light as much as the "those folks are way, way, waaaaaaaaaaaaaay down there at the other side of the bridge effect.